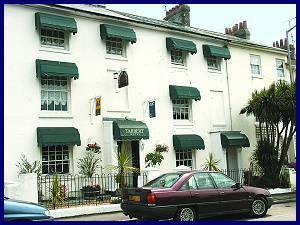 Tarbert Hotel and Restaurant in Penzance, West Cornwall, UK, offers 2-star quality accommodation and hospitality and is ideally located for tourist and business visitors. Penzance is a delightful market town and an ideal centre for touring the area, and the Hotel provides B&B or dinner, bed and breakfast for a short break or a longer vacation. Cornwall is a land of contrasts, myth and mystery. The scenery is second to none - blue seas, white beaches and lush tropical vegetation abound on the southern shores of the Land's End Peninsula whilst the Northern shore boasts spectacular rugged cliffs and moors. A walk on the cliff paths on a sunny day is pure food for the soul. 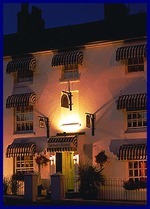 The Hotel, situated close to the centre of Penzance, is part of a Georgian Terrace of houses which were originally built in 1830 by Harrods Investment Corporation as homes for the Merchant Sea Captains who sailed the world in search of exotic goods for Harrod's discerning clientele. The original owner, Ralph Sheldon Kindly was lost at sea in his quest for such treasures. Our hotel features great amenities with each room benefiting from flat screen TV's, Smart TV box, trouser press, hair dryer, coffee and tea making facilities, access to gaming, plus much more.